Brav�! �etta var fr�b�rt! Also fav'd. It is stolen, it has been made unfunny, and it is very old. EPIC! Moar Chrilden and Babbys please. Taco Bell, product placement with Taco Bell. Your voice sounds like Vegeta's.....5'd. That made my day. They need to do way instain kakrot. I logged in just to say f*ck you to this comment. Okay, now that's just hilarious. and Time Magazine gave these bloggers Man of the year status. thats one of the coolest voices ive ever heard. missed "babbys" and "chrilden" - too glaring to forgive. █ █ █ █ █ █ █ █ █ █ █ █ █ █ █ █ █ █ █ █ █ █ █ █ █ █ █ █ █ █ █ █ █ █ █ █ █ █ █ █ █ █ █ █ █ █ █ █ █ █ █ █ █ █ █ █ █ █ █ █ █ █ █ █ █ █ █ █ █ █ █ █ █ █ █ █ █ █ █ █ █ █ █ █ █ █ █ █ █ █ do more of these !!!!! It works best if you're more careful. dud dont you think its supposed to b f*cked up like that? You should really do voiceovers for anime or something I don't know. Your face is epic. voice*, not face...how the hell did that happen? Wow, this is a really dramatic story. Too bad those poor babbys can't frigth back. These babby cant figth back? I'm in ar! truley sorry for your lots. OH SNAP!!! OH SNAP!!! OH SNAP!!! OH SNAP!!! OH SNAP!!! OH SNAP!!! OH SNAP!!! OH SNAP!!! OH SNAP!!! OH SNAP!!! OH SNAP!!! OH SNAP!!! OH SNAP!!! OH SNAP!!! OH SNAP!!! OH SNAP!!! OH SNAP!!! OH SNAP!!! OH SNAP!!! OH SNAP!!! OH SNAP!!! OH SNAP!!! OH SNAP!!! OH SNAP!!! OH SNAP!!! OH SNAP!!! OH SNAP!!! OH SNAP!!! OH SNAP!!! OH SNAP!!! OH SNAP!!! OH SNAP!!! OH SNAP!!! OH SNAP!!! OH SNAP!!! OH SNAP!!! OH SNAP!!! OH SNAP!!! OH SNAP!!! OH SNAP!!! OH SNAP!!! OH SNAP!!! OH SNAP!!! OH SNAP!!! OH SNAP!!! OH SNAP!!! That was a good reading! 4'd. Needs to be cited. you took this from somethingawful. IT'S NEITHER THE SAME SOUND OR SAME PICTURE AS SOMETHINGAWFUL HONESTLY. FEEL FREE TO CHECK THAT. You feel that using a SH*TTIER picture makes your site less stolen? Everything about it is exactly the same as Somethingawful's version. Everyone's played Castlevania SOTN, right? Not like it took much effort to take someone elses idea and put it here anyway. You lose, good day sir. Uh, judging by the rating and how funny this site is, he didn't really lose. I honestly cannot understand some of that. That is saying something too. i was on the floor after the first line. well done! I can't believe I found this funny. But I did. 5 now with the ending and new comments. I had a dorm room full of guys and we all busted our nuts on this and over my face! This was even funnier the 2nd time around ... rofl. bad grammer always is a five. HilHarious. Babby's cant fright back? I would have thought so. "ALSO I AM NOW NEVER PUTTING THE SLIGHTEST EFFORT INTO A YTMND AGAIN GOODBYE"... I know how you feel. He isn't sorry for his lots. N*gg* stole my english language! are you that taco bell guy? this is so good it has to be faked. These YTMND's are always epic. EPIC. ........what the HELL are they even talking about? I don't even understand what the point is, the grammer and spelling errors are so bad. YAY AMERICA!!!!! Damn right, Nitros. Good choice of music! I had to login to vote five, and FAV! So, you pull a something awful-like reading of a stupid forum post and you put it on YTMND? Meh. Have a 3. This sounds like something Smeegol would say. MY PRECIOUS BABBYS! Dude, you get an insta-5 for your reading of that sh*t.
Did someone mention Star Control?! Hell yes. ^ if you don't get it then don't vote. i lol'd at this. i laughed so hard and long, i snorted. love it. I was crying at this. I die everytime I hear babby. Babbys and chrilden were mispronounced, but have a 5 anyway! Maybe the dingo ate your babby! Taco bell needs to quit drinking. Some people should NOT have access to the internets. Best YTMND ever (except for the original.) I have never in my life laughed at an internet website in my life as i did today. That was amazing. Thank you very much. Hold! What this YTMND is doing is lol! Why are you doing this thing? Laughing too hard, can't breath. This deserves to be on the front page as much as Telemarketer does. "Hold! What this YTMND is doing is lol! Why are you doing this thing?" WHAT GLORY! yeah. the ending is the best part. "ok looks *ssh*les"
Translation: "They need to do away with these insane mothers who kill thier babys, because these babies can't fight back. It was on the news this morning; a mother in Arkansas who had killed her three kids. They are taking the three babies back to New York to be laid to rest. My prayers are with the father who lost his children. I am truly sorry for your loss." HAAHAA I knoawn whaot he menz. we'll you got somewhere near 9000... so 4'd. More like people who write this sh*t need to be killed, do they attempt to write in any legible language, or do they bang their fists against the keyboards and pray that something that resembles english comes out? that voice belongs in voice acting. seriously! it's better than 95% of the voices in oblivion! That really moved me...I feel awful for their lots now...truley afwul. My bum is on the babby. 'I am truly sorry for your lots' is almost as bad as 'all your base'. LOL, reminds me of the Bauman Dramatic Reading, please make more. Dramatic reading of a retard FTW! I believe the woman took it off of her yahoo answers due to harrashment torwards because of it. haha, sucha good one dude. awesome. chrilden. I just listened to the end :) Actually, shouldn't you cite the music? Nevermind, I don't care enough. Faved. OMG i hvnt loled like this an too long. you are win also vegeta voice. It was not by my hand that this YTMND was fived. +5 for not citing. F*ck you f*ggots, YTMND isn't a research paper. 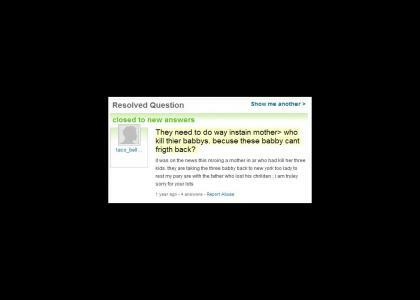 WHO KILL THERE BABBYS. Like, what the f*ck? you should make more like this. it's freaking hilarious. can't close the window. I loled hard. +your voice is epic. I have to fav this. such an annoying voice...not sure why this has over 900 vote. Your Voice Is Like That One Guy With The Hair. It's fun when people do these. I laugh at people who make so many mistakes like that. Views All Time 17,498 "2007-01-23 14:16:18 mrtenk we'll you got somewhere near 9000... so 4'd. " Control F his name to find him... he should change his vote now..